Generally consistent is an important provision in the settlement that provides a path to both pre-effective and post-effective date players to obtain a diagnosis and compensation in the settlement. That mutually agreed upon standard has been under attack by the NFL from the time the first dementia (Levels 2.0 and 1.5 Neurocognitive Impairment) claims were filed. Tighe first filed a motion to bring this to the court’s attention in August 2017. The motion was quickly joined by motions filed by other attorneys. Opposed by both the NFL and Co-Lead Class Counsel Chris Seeger, the motion was denied by Judge Brody. In March 2018 Class Counsel Locks Law filed a motion seeking an administrative roll in settlement implementation in part to address the NFL’s attacks on the generally consistent standard. 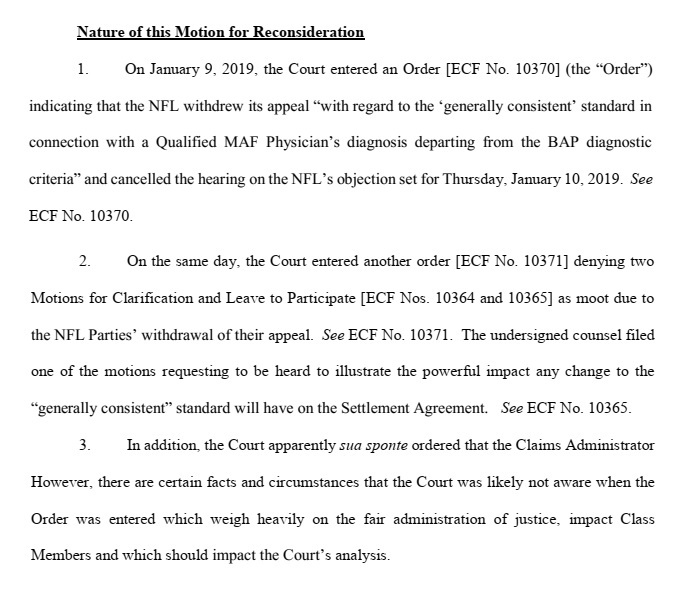 As with the X1 motion, numerous motions of joinder were filed by independent law firms and other class counsel and executive council members, but again, the motion was opposed by both the NFL and Co-Lead Counsel Seeger. Judge Brody denied this motion as well in a stinging opinion that bordered on questioning the integrity of Locks and those who joined with him. The NFL continued to pursue its relentless attack on dementia claims, petitioning the court for a special fraud investigator, and claiming that the settlement was being overwhelmed by fraudulent doctors and lawyers. After deferring a decision for a time, Judge Brody granted the motion and on December 10, 2018, appointed Lawrence Stengel to the position. Meanwhile off the public docket, the NFL made additional attempts to circumvent “generally consistent.” Claims have been placed in audit under the guise of fraud prevention, only to be cleared and sometimes placed back in audit because the NFL has produced some kind of circumstantial evidence they found on a former player’s social media account or elsewhere on the internet. Any perception of functioning in a social environment, whether a sporting event or a church was considered suspect. If a dementia claim either bypassed audit or emerged as trustworthy, it was likely to be appealed. A glance at the most recent claims report, dated January 21, 2019 shows beyond a doubt dementia claims are targeted. The program has audited 55% of all claims, however most of these seem to be for dementia diagnoses, with other types of claims falling into audit far less frequently. 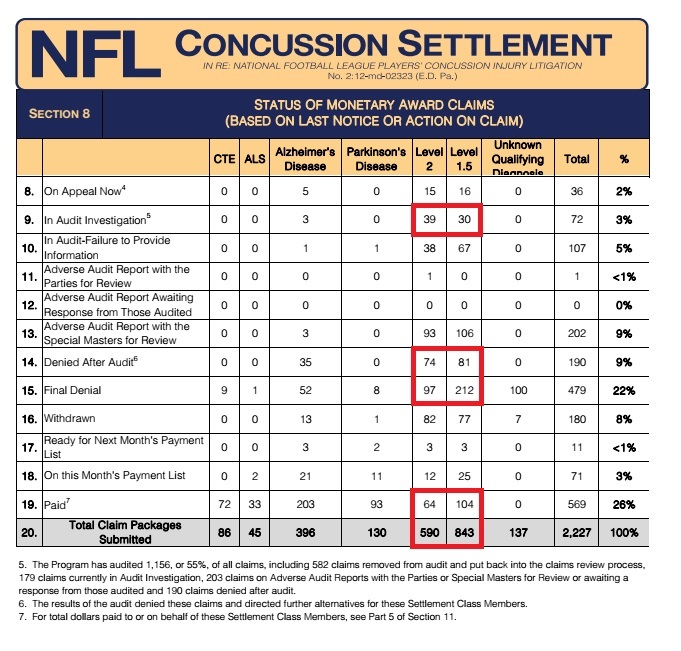 Of 1,736 retired player (or representative) claims filed, 1,433, or almost 83% are dementia claims. Conversely, only 168, or 12% of dementia claims have been paid. 309 dementia claims (22%) have reached a final denial. The rest fall at some point in between, and the NFL wants to make sure most of those are not approved. Any claim done outside the BAP is evaluated on a generally consistent standard. This includes pre-effective date claims that were diagnosed by a privately retained doctor, and MAF claims, which are the alternate route to the BAP for a post-effective date diagnosis. The BAP is a very rigid settlement defined protocol, in which only the most severely impacted players will receive a diagnosis that would qualify them for a monetary award. If players are diagnosed as “generally consistent” then their diagnosis must have more in common with the BAP than differences. A comparison might be if the condition were cancer rather than neurological impairment. 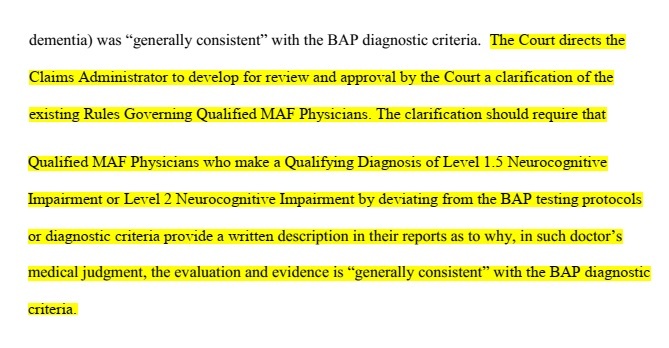 The NFL is willing to pay those in stage 4 or maybe late in stage 3 but considers those in stages 1 and 2 insufficiently impaired and as such refuses to compensate them as being “generally consistent” with impairment at a time when compensation is most needed and could be used to help stall the ravages of the disease. The generally consistent standard helps those with a legitimate diagnosis that might be in earlier stages to receive the help they need when it is likely to benefit them most. Tighe’s motion brings us to the current situation in which the “generally consistent” standard faces its latest threat. Tighe refers to a cancelled hearing, on January 10, at which he’d filed a motion to address the court, in addition to other counsel who’d requested to speak. I had planned to cover the hearing first-person and was 5-hours into an 8-hour drive to Philadelphia when I got word that the hearing had been cancelled. I wasn’t the only person who made a trip for naught. Several attorneys had planned to attend. I’m aware of one who learned of the hearing as his plane taxied down the runway, and another who found out upon landing. Some reporters made the trip as well because of the potential impact of the issue at stake. It was stunning that such an important hearing was cancelled less than 24-hours before it was scheduled to take place—stunning, but in retrospect, not surprising. As I wrote previously, the last thing the NFL, Seeger, or Judge Brody wanted to deal with was a courtroom filled with reporters and lawyers whose voices have thus far been silenced, some of whom, I’ve been informed considered bringing some of their suffering player-clients to bring the court’s attention to the human cost of the NFL’s attacks. The NFL certainly didn’t want sick former players competing with the Super Bowl. Judge Brody has been careful to keep much of the docket closed to shield the settlement from public scrutiny and Seeger has balked at criticisms of the settlement and on information and belief utilizes a PR firm to try to keep the public face of the settlement presented in an attractive way. It’s highly irregular to cancel a major hearing with under 24-hour notice and equally irregular for a judge to issue a sua sponte ruling on an appeal that was mooted by withdrawal. The only reasonable explanation for this is that a conference or negotiation ensued – with or without the judge—and an agreement was reached that she endorsed through issuing the apparent sua sponte order. What would the amendment be? On the surface this doesn’t look unreasonable at all. In fact, many doctors already provide something along this line and Judge Brody states she’d been made aware that some doctors had not done so. Beep beep! 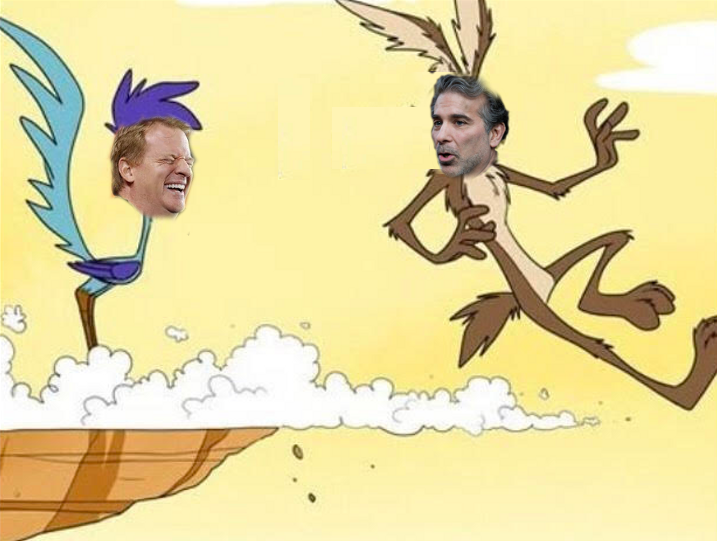 It appears that Road-Runner NFL foiled Coyote Seeger once again, taking the judge along for good measure. There’s another appeal that has been raised by the NFL that works alongside the generally consistent appeal. Judge Brody hadn’t ruled on that one, nor has she scheduled a hearing. It’s highly likely she won’t and that one will be handled in the same manner as the generally consistent appeal—privately outside public view. 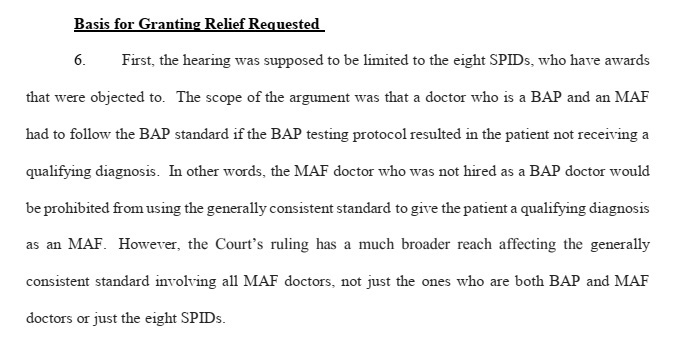 That appeal would mandate that Special Masters confer with the AAP for any claim approval hinging on a “technical medical issue.” The settlement requires AAP consultation for pre-effective date claims and is discretionary for any others. Should a doctor be required to put on his legal robe and qualify why his diagnosis is generally consistent upon rendering the diagnosis, then it gives the NFL an area to appeal that hinges on a “technical medical issue.” Previously, a doctor could submit a diagnosis and if it was questioned then respond with his reasoning for rendering that diagnosis. Now he must weigh it against the BAP and make a legal determination as to if it meets the “generally consistent” standard at the beginning. This is beyond the scope of a doctor’s training and area of expertise, and in my opinion a way of lining up lambs for the slaughter. I’ve been studying NFL litigation for close to 4 years, now. Presumably Mr. Seeger and perhaps Judge Brody conferred with the NFL in good faith, assuming the NFL was also dealing with them in good faith. Unfortunately, I have never observed the NFL deal with anyone in good faith. The legal team and the commonly known faces of the NFL are quite different in their methodology. While the bumbling commissioner and the owners he represents tend to bobble and weave in areas of controversy, always reacting instead of being proactive, sometimes dodging the media to keep from answering questions, or when they feel they must go public, making statements and then contradicting them, or fumbling around like the village idiot, their lawyers function like a well-polished machine. Despite their very public errors the league heads did have the foresight to hire highly competent lawyers. The white-shoe law firms they enlist are staffed with elite attorneys who calculate every move. Their litigation strategies are well planned to produce a certain objective, and the ruling from Judge Brody is probably the objective they sought from the beginning. Beep, beep! Tighe points out the broad reach of Judge Brody’s order. While her decision, had she ruled on the motion, would have had precedential value, the NFL’s appeal directly impacted 8 claims and a direct ruling on their appeal would have directly impacted 8 claims. The sua sponte ruling affects the entire class. Most important from a legal standpoint is Mr. Tighe’s assertion that a modification to “generally consistent” would amount to an amendment to the settlement which in accordance with civil procedure requires notice to the class, ability to be heard and an opportunity to opt out as defined by FRPC Rule 23 which governs class action settlements. From an ethical standpoint, changing the rules after those who agreed to those rules have signed away any other legal remedy, is the epitome of bad faith. To offer a sick person hope and then yank it away in this manner is a form of cruelty paramount to torture. Tighe refers to In Re: Deepwater Horizon, another settlement in which BrownGreer was claims administrator. In that settlement Orran Brown made the decision to deviate from the agreement in a manner favorable to the class, but his decision was challenged and rejected because it was a modification to the terms of that settlement. It seems odd that in this instance the court would request him to modify this agreement by adding an extra layer of difficulty for the class. It’s entirely possible that neither Seeger nor Judge Brody see this as a modification because they haven’t envisioned it being weaponized by the NFL. What is it they say about learning from history? Now might be a good time to consider doing just that. Of course, since Mr. Seeger has very few individual clients whose claims are fought tooth and nail, it’s feasible that he’s unaware of the hurdle just imposed. Likewise, the judge is probably unaware of how this seemingly innocent order can be weaponized by the NFL. Perhaps she will intervene if it becomes apparent to her. Perhaps she won’t unless her docket becomes unbearably “loud” bringing unwanted scrutiny. Having witnessed the NFL appeal two of his decisions that were deemed “final and binding” as finding of fact, perhaps the Special Master will see through the NFL’s attempts at manipulation and simply carry on as usual; or perhaps he will appease and defer to the AAP, who thus far have seemed hostile to the best interest of players. There are many questions in play but no clear answers as to how things will proceed. Based on past actions, I expect that Judge Brody will deny the X1 motion. What happens next is anyone’s guess.